Triadic Legends (2009), a suite for mechanical piano, is dedicated to Kyle Gann. The work is a set of three pieces designed to be performed by a mechanical (player) piano (e.g., Yamaha Disklavier or PianoDisc). Each of the three movements uses basic triads as the principal material. Triads are employed for their raw sound, but also their ability to immediately conjure up “functional” progressions in the listener’s ear. Each movement contains a repeating, steady layer that modulates throughout the movement. The title of the first movement, Truest Horse, is taken from what was for me (for no particular reason) the most memorable simile in William Shakespeare’s A Midsummer Night’s Dream — “As true as truest horse that yet would never tire, I’ll meet thee Pyramus at Ninny’s tomb….” This simply-constructed movement takes its inspiration from the rather silly “play within a play” performed by Shakespeare’s “rude mechanicals.” The same ideas (without any development) are overlapped in different, schizophrenic ways. A driven 16th note pattern runs throughout, punctuated by triadic arpeggios that assert themselves (without tiring) in the treble register. The Strangeness of Kindling explores melody and counterpoint with the kinds of idiosyncratic modality that have interested me in the past several years. 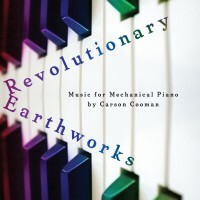 However, due to the rhythmic capabilities of the mechanical piano, the melodies and counterpoint unfold primarily in a rhythmic relationship of 13:7:4:3. The movement begins with the substrate layer (the 3), consisting of a series of quasi-functional modal triads. These generate the modality of the upper lines, though they are often offset in time, creating the overall poly-modal sonority of the movement.